Like so many New Yorkers in the 80s, I grew up as a girl in NYC feeling that that Graffiti was just rude and ugly vandalism thrust upon undeserving commuters. Maybe it was to some degree but it was also art, art of the streets and of the youth. And now when I look back I wish I had been able to appreciate the creativity, passion and intelligence behind it then, the ethnography, the historic record and narrative it would become. I notice graffiti now wherever I go. I even seek it out when I travel because it tells me more about who has imhabited the are then the story the developers would like us to believe. I won’t miss out on it this time around. The subway dancers. You love them, hate them, or don’t care about them at all but if you live in NYC and ride the MTA, you probably have had to tolerate them several times in your journeys. Young African American teenaged boys who travel in small goups with the odd girl or two sprinkled in on occasion. They come on the train with a radio or some music playing device playing something with a hot contagious beat. One of them yells “Showtime” and claps his hands while they each take turns doing gravity defying flips, twists, kick and somersaults all while on a moving train. And I have never seen anyone get kicked in the face. I can barely keep my balance on a moving train if I let go of the pole or bar for four or five seconds. 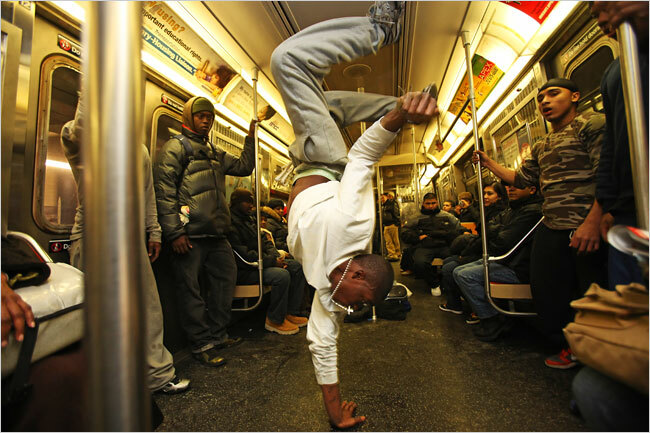 I not only like watching them dance but I also like watching the ways in which they transform the subway car and change the energy around them. Kids always look on with wonder and amusement and return the extended fist bumps. Tourists usually love them and show it with cash. The girls they flirt with often drop their stiff faces and break into giggles. Some people ignore them, move away, stay in their own worlds. Others like older people who you think might not like them clap their hands in support. Some people look at others for some idea of what and how they should feel about this. Others give the dancers pounds, smiles, laughs. Some hit record on their cell phone video cameras. I’ve done it once or twice when I’m on the mood. It’s New York City where anything can happen and I know that one day these subway dancers will be a thing of the past, relegated to photographic record, part of a cultural narrative of NYC’s past. But I like to enjoy them now, in the electric present where they belong, the voice of today’s youth channelled through physical expression, pushing the boundaries of performance. The streets are where so much of our popular art comes from. And I love a museum exhibit as you well know but I like just as much when art suddenly happens like an accidental wrong turn, dirty, unsolicited and occasionally disturbing. It doesn’t always have to be sterile and meticulously selected or curated and pinned behind glass. You can touch it, smell it, taste it, feel it, sometimes without wanting to. Keep your eyes on it while they’re still on this side of the gallery. Feel it. It’s free and It won’t last forever.